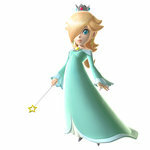 Some nasty folks have had away with Princess Peach and made off with her into space. 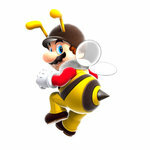 Fortunately, Mario has found himself able to follow, so off he trots... well, flies. That's the plot. 'Nuff said. The real leap here, of course, is from the tried and tested controller to the Wii's remote and nunchuck combo. You can use the Wii Remote as a pointer at virtually any, um, point in the game, collecting small stars from the ether and firing them back at enemies or obstacles. 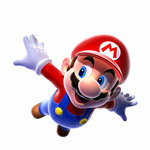 But that's only the most basic incorporation of remote control that Mario Galaxy has to offer. With intuitive use of Remote movement, Mario can also spin, roll, shoot fireballs, catapult himself, tractor-beam himself through zero gravity areas, and do other things that you'd be better off finding out independently . 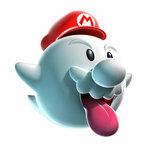 In boss fights, too, Wii Remote movements are used for the delivery of attacks and killer blows while the Nunchuk's analogue stick controls Mario's basic movement. 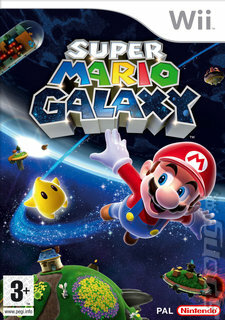 Happily for long-time Nintendo fans who were beginning to suspect that Nintendo had given up entirely on producing real games with real gameplay challenges, Galaxy is not easy to complete. The trick Nintendo Tokyo has pulled here is quite an ingenious one: Galaxy gives you all the moves you'll ever need and makes sure that it's perfectly easy to use every last one of them, but then it takes the liberty of pushing Mario to his outer limits through a long string of stages that appear to have been designed by madmen. There's something of The Prisoner about it: you're trapped in a pretty messed up place where nothing is ever quite what it seems, and you find yourself in ever more bizarre situations. In comparison, looking back, the level design in Super Mario 64 is tame.